Does anyone remember this post last October where I teased you with this picture? It all started when I bought a gazillion pints of raspberries because they were unseasonably on sale for $1 each at that time. After we ate half a gazillion, the rest were about to go bad, so I decided to try my hand at homemade jam. It’s something I’ve never done but always wanted to. Let me tell you, it couldn’t be easier! 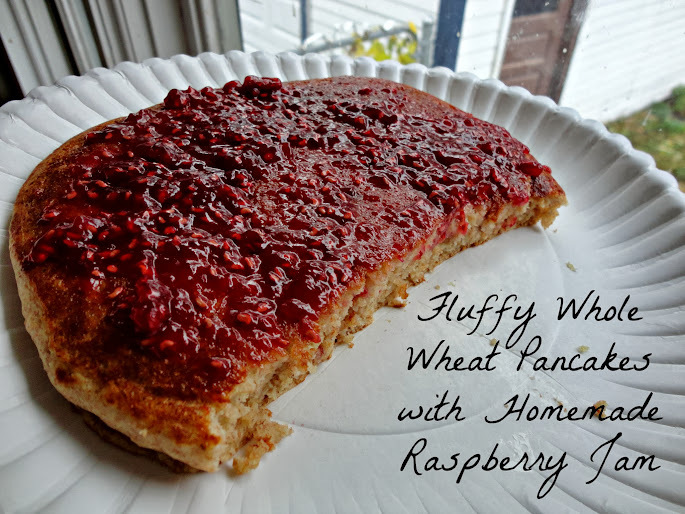 You don’t even need to go out and buy pectin, at least not for this recipe. That’s one reason I never made it, it just annoyed me that I needed to go buy something that was already in fruit anyway. 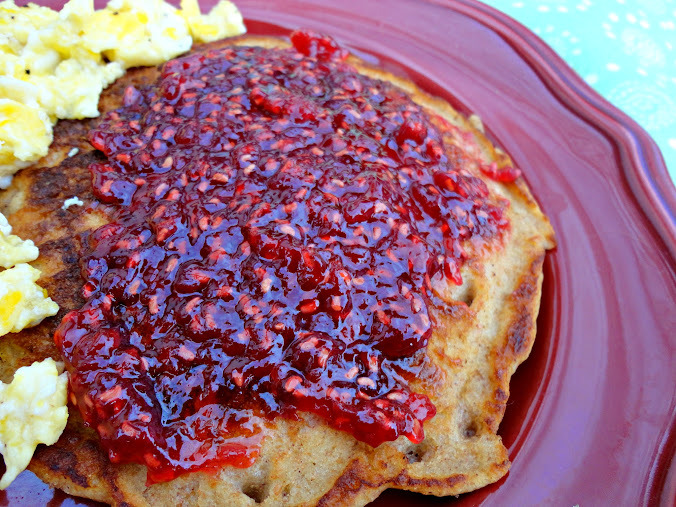 This method uses a method of cooking the sugar first to gel the jam, rather than an abundance of pectin. Cool. If you’ve never had homemade jam, there is just no comparison to store bought. So good. You might not be able to eat store bought after making your own! And if you can bear to part with some, it makes great gifts too. Combine all ingredients in a large saucepan and bring to a boil over high heat, stirring to combine and break down the berries. 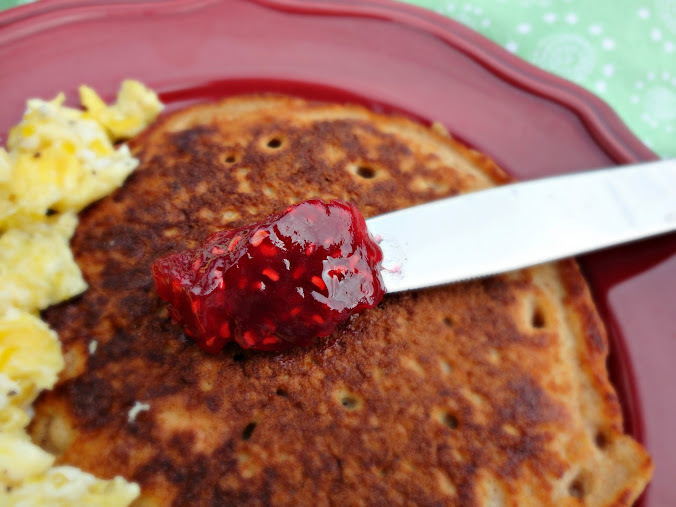 I mash them with my spoon or a potato masher to break them down and the jam still has a pleasantly chunky consistency when finished. Cook until jam reaches 221 degrees, or until a small amount gels on a plate when placed in the freezer for 2 minutes. Pour into a 4-cup glass measure and pour into sterilized & prepared jars. Screw on lids and allow to sit until sealed. Jars may be stored in refrigerator for up to a month. For instructions on how to can the jam to keep it at room temperature for up to a year, click the recipe link below. Posted in Condiments & ETC. 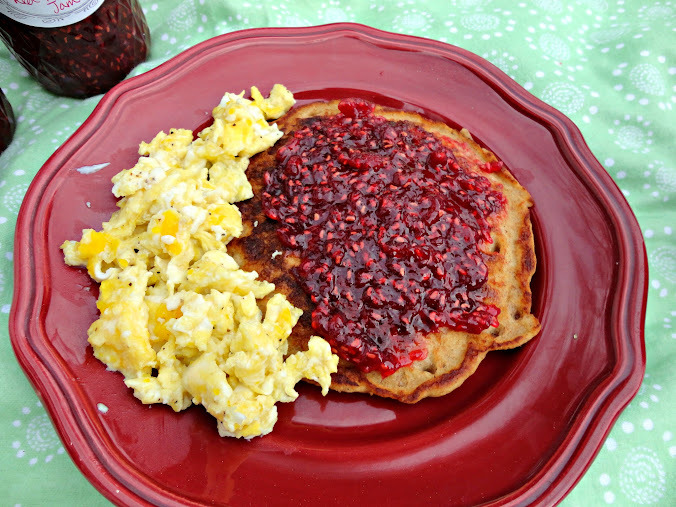 and tagged canning, easy, fresh, homemade, no pectin, pectin-free, raspberry jam, recipe. Bookmark the permalink. I think it’s a woman thing lol. My hubs always says, “But do you really need it? Because if you don’t, you’re still wasting money, even if it’s cheaper.” Men and their logic – phooey. Awesome! 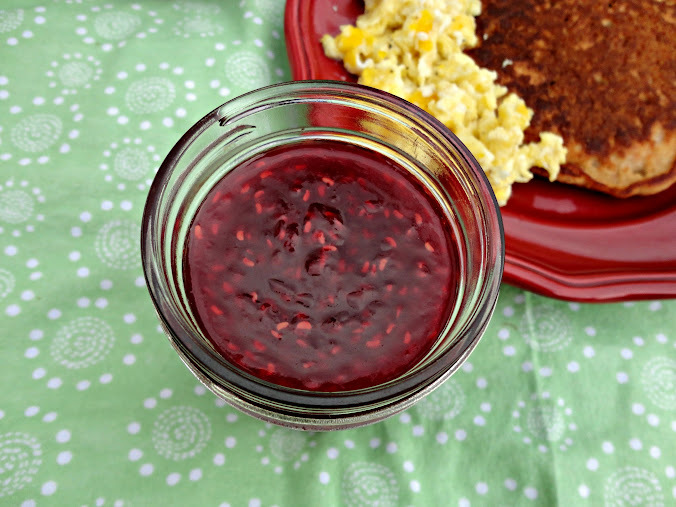 Rasperries and blackberries are my favorite fruits…and we would LOVE this jam. Looks so tasty. Who could resist such a great bargain price on those berries?? So great you can enjoy them for a long time this way. MMMM! Ummmm…the jam was gone in a week. Although I admit, I shared with three other people! haha Still, I ate it on everything that week – it’s so good. I’m going to try this method if I can find some berries at the farm market. Love raspberries and blackberries. sounds delicious! i wonder if you could freeze this jam? i always make freezer jam but i’d love to can one day. I don’t see why you couldn’t. I actually can everything I make this way (mostly cranberry sauce) and although it’s not the typical (safe) way, I’ve never had anything go bad staying at room temp, for even up to a year. So much easier too! I think you did outstanding! Wish I could find some dollar pints. They had another $1/pint sale last month but being on a tighter budget, I could buy as many. I bought five and had a coupon for $1 off any fruit purchase of $4 or more so I ended up paying $4 for 5. Not too shabby! I’ve never made homemade jam before, but it is so something I would like. Then I can gift everyone with it!! Yours looks absolutely delish! Thanks Liz, you really should try it. So good. 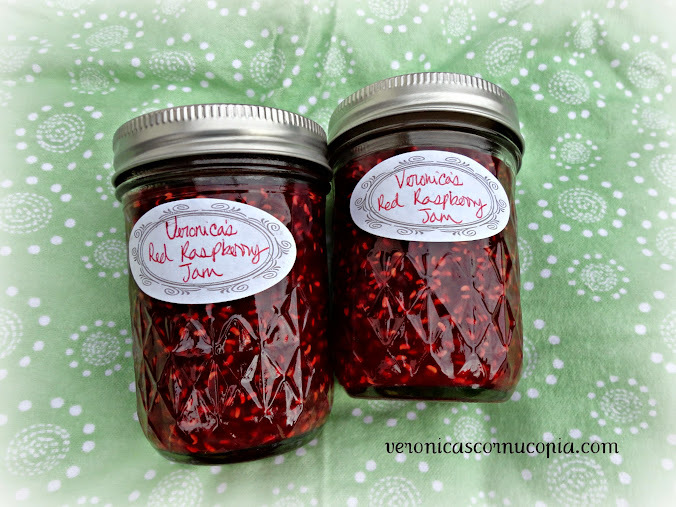 Veronica, your raspberry jam looks scrumptious! I am so happy that this is prepared without pectin but still quite thick! Excellent! You have jam making SKILLZ. And I’m with you on the pectin! That and the whole sterilization/processing of the cans is what scares me away from jamming! Yup, me too! I love this method of canning b/c you don’t have to do any of that, you just let the heat of the jam seal the jars. It’s not FDA-standards safe but as long as the lids seal, my canned stuff always stays good for at least a year or longer.